In an interview with Vulture, an actor from the episode talked about Glover’s incredible show of method acting on set. If you haven't gotten the chance to watch the latest episode of Atlanta (season 2, episode 6), the 40-minute, commercial-less showing followed Darius (Lakeith Stanfield) as he tried to acquire a piano from a spooky, secluded old white man named Teddy Perkins. 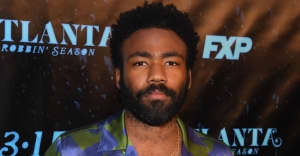 In a new interview with Vulture, Derrick Haywood — who plays Perkin's brother Benny in the episode — revealed that Teddy was in fact played by Donald Glover, and that Glover did not break character during the entire filming of the episode. "When I say this guy was in character the whole time on set — it was just amazing the commitment he brought to the character....They were calling him Teddy, he acted as Teddy. There was no Donald on set whatsoever. I kid you not." Check out a trailer from the episode below. Atlanta on Thursdays at 10pm EST on FX.